LISBON, Aug 16 2013 (IPS) - The elderly have taken to the streets in Portugal to protest drastic public sector pension cuts announced this week by the government of conservative Prime Minister Pedro Passos Coelho. Never before had so much grey hair been seen in the frequent anti-government demonstrations. Shoulder to shoulder with employed and jobless workers and often leaning on the arms of their grandchildren, senior citizens have come out on to the streets in defence of their fragile rights. Temporary workers, civil servants and pensioners have been hit hardest by the harsh austerity measures imposed by the International Monetary Fund, the European Union and the European Central Bank in exchange for a 110-billion-dollar bailout package in mid-2011. Since then, the so-called “troika” has dictated the public finance policy of this crisis-stricken country of 10.6 million people. The cuts announced by the government for this year and next in the state administration amount to 4.92 billion dollars – half the sum spent to bail out three private banks, the opposition and trade unions complain. 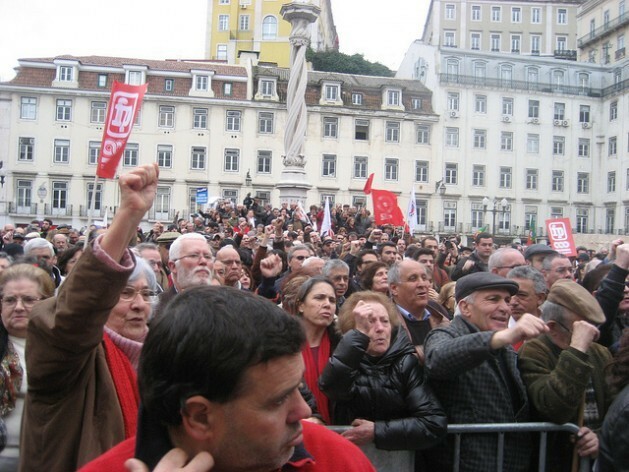 The additional cuts in pensions are even worse than “all the damage already done to pensioners,” said Jorge Nobre dos Santos, head of the Frente Sindical da Administração Pública (FESAP), a public employees’ union. “The money has been and still is being managed by all sorts of agents, governments and politicians, without even asking the permission of its legitimate owners,” those who paid in to the Portuguese Social Security (SSP) system all their lives, dos Santos complained. He pointed out that the measure is retroactive, violating the state’s commitments to its retired workers. The strategy is to engulf all pensions, “whether public or private,” he said. “The state’s credibility is at stake; it is being undermined by the prime minister,” he maintained. The FC has pledged to do everything possible to block the new measure. “The attempt to reduce pensions plunders those who have contributed to the system and have pension rights,” said Alcides. The only alternative for hundreds of thousands of people in Portugal “is to express outrage over these measures, that are unprecedented in their harshness – a veritable robbery of what has been discounted from our pay throughout our working lives; this is money that is not the state’s, but our own,” said retiree Armindo Brandão, who faces a 9.5 percent cut in his SSP pension. “For me, with my pension of 1,020 dollars, this is an enormous reduction, as well as being sheer robbery, but as the robbery is committed by the government, the thief is not arrested,” Brandão said. The pensioners’ protests have turned violent, with almost daily verbal and even physical attacks on SSP or General Tax Directorate officials. The situation “amounts to a confiscation of the assets of those who paid contributions all their lives and who now see their pensions cut in an unprecedented act of plunder,” says an Aug. 13 ARE communiqué. The feeling among those most affected by the crisis is one of profound injustice, as shown by a letter sent to the Lisbon newspaper Público by a reader, Manuel Morato Gomes. While cuts are being made even in widows’ pensions, no explanations are being given for “the exceptions for former judges and diplomats, or for the life pensions granted to former members of parliament, government ministers and presidents,” Morato Gomes complained. IPS consulted another retiree, Feliciano, a former soldier who fought in the colonial wars in Portugal’s former colonies in Africa (1961-1974), where he lost a leg. He receives a modest disability pension. “I survived the war in Guinea Bissau, although I was severely injured, but I do not think I will survive this government. It only wants to get rid of the old people; let them die as soon as possible, so the state can balance its books,” he said. Portuguese President Aníbal Cavaco e Silva has taken the precaution of asking the Constitutional Court to rule on the legality of the government’s proposed budget cuts bill, which includes lay-offs in the civil service.